Regional Finance is owned and operated by Regional Management Corp. headquartered in South Carolina. 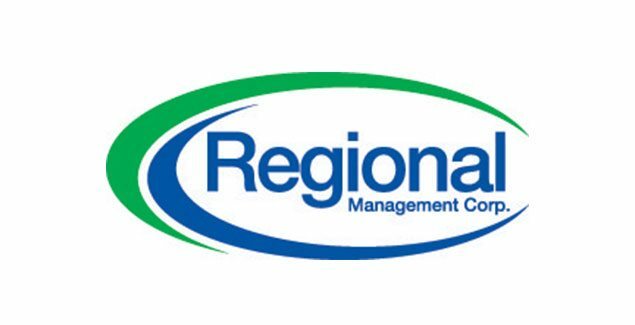 Regional Management Corp. is a publicly traded company on the New York Stock Exchange under the symbol RM. It is a financial services company best known as a loan company. At Regional Finance, they promise loans to fit every need. These loans come in three types; small personal loans, large loans and auto loans. With the small personal loans, Regional touts a package that can be just the right amount to get you through unexpected events when you need a loan quick. Their small secured loans up to $2,500 are typically payable on terms of 6 to 24 months. Include loans for larger purchases such as furniture, appliances or cars in which cases Regional offers large secured loan. This package ranges from $2,500 to $12, 000, and can provide payment terms up to 48 months to fit your budget. This loan is designed with your car dreams in mind. If it is time for a new car then Regional could help you get the car of your dreams. Their auto loans are designed with you in mind. Find the car you want and they will do their best to help you find the loan that’s right for you. They offer loans up to $27,000. The loan process for Regional Finance is descriptively easy. All you have to do is fill out an online application or contact the Regional Finance branch nearest to you, and their friendly, qualified branch representatives will take the time to listen to your financial needs and work with you to find an amount and payment plan that is right for you. This is applicable even to customers that have less than perfect credit. They promise to consider your individual situation and credit background and then work with you to try and find a personalized financial solution that fits your needs. As has been pointed out in the loan type breakdown, their loans range from $2,500, larger loans up to $12,000 and auto loans up to $27,000. Regional finance requires collateral in the form of personal property (TVs, stereos, etc.) and/or car or truck titles. The institution will never require you to pay up-front costs or fees prior to receiving your loan proceeds. If you are ever asked to pay an up-front fee by someone claiming to be a Regional Finance employee prior to receiving your loan proceeds, you may be dealing with a scam lender, and you can contact Regional Finance immediately at (877) 762-8011. You may also contact your nearest branch, which can be found on their homepage by entering your zip code. Currently, Regional Finance accepts the following payment methods; cash, checks and money orders. One time electronic payments, Debit Card & Electronic Funds Transfer, are also available in the following states: South Carolina, New Mexico, North Carolina, Oklahoma and Virginia. Regional Finance offers payment protection plans to the tune of; life, disability, involuntary unemployment, personal property and auto single interest coverage. (Exclusions and limitations apply and vary by state).